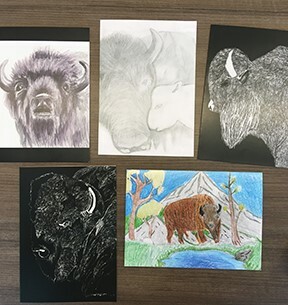 These beautiful greeting cards were made from our young artist winners at the 2018 Winter Conference. Cecil Miskin with Buffalo Gold Premium Fibers took the lead on getting these done and we cannot thank him enough for spearheading this fun project! Packs of 5 (one from each artist) greeting cards with envelopes are available for purchase. Cost is $20 per pack, plus shipping. There are only 100 sets available and all proceeds go to the NBA!